– Demmen brought his subjects into his studio for this photograph of Javanese men engaged in one of their popular pastimes. 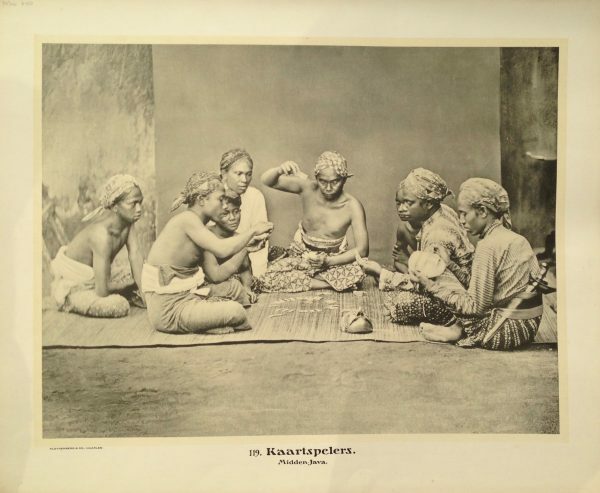 Card playing had been introduced to Java centuries earlier by the Chinese. Gambling is illegal today, but of course it still goes on. In Demmeni’s day the Dutch government attempted to control gambling by establishing licensed gaming houses and profit from it by establishing licensed gaming houses. Entire family fortunes were lost with a flip of the cards. In extreme cases, gamblers sold themselves as slaves to settle their gaming debts. Antique school board of Prauwen voor Zoutervoer Taken c.1895 and published between 1912 and 1914 in Holland.